From the DDAF Come Celebrate Doris' 92nd Birthday in Carmel! Another year has nearly come to an end, and we are already planning Doris’ 92nd Birthday Celebration. It will be another fun weekend, Friday April 1 and Saturday April 2, 2016. While Doris is NOT expected to attend, we will have a full schedule of events honoring our dear lady. Friday evening, the Cypress Inn will host a VIP reception featuring some of Doris’ co-stars* from her movies for a Meet and Greet. Come meet celebrities such as Kym Karath ("Gretl" in "Sound of Music") and Brian Nash (from TV's "Please Don't East the Daisies"), Doris' kids from "The Thrill of It All,” and join them later for a Q&A.Also later Friday evening, Jim Martinez and Laura Didier will perform a concert of Doris Day songs at the Church of the Wayfarer, across the street from the Cypress Inn. The celebration will culminate on Saturday evening with the talented Scott Drier performing his critically acclaimed “Doris and Me” show, paying loving tribute to Doris Day. The show has been a sell-out from coast to coast, so don’t miss it! Accommodations and seating are limited, so call soon to make your reservations. 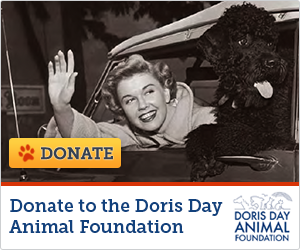 A portion of your room rate at any Cypress Inn property will go to the Doris Day Animal Foundation, along with all proceeds from "Doris and Me." To reserve your room, call the Cypress Inn at 831-624-3871. To reserve your VIP package ($150) or tickets ($50) to the “Doris and Me” show, call 831-620-7455. Remember, all proceeds will go to the Doris Day Animal Foundation. Don’t miss out on this fun and fabulous weekend. Rooms and seating are limited so don’t delay! Make your reservations now! *Celebrity co-stars subject to change, depending upon availability.